Equally as important is having an understanding of the subconscious meaning and message of each color. We have all been there before; we see something colorful (a wall, an ad, a sign, piece of clothing) and we involuntarily feel a certain way. This is the power of color. One of our tactics here at Hype Strategic is presenting companies with a color palette for their brand composed of roughly 6 colors. In the creative development, we choose an overall dominant color, but provide “supporting” colors that accompany the main color in a variety of ways (accents on business cards, websites, ads, etc.) Having a balanced palette of colors for your brand is a great way to add depth to your brand (and allows for freedom in design without having to limit yourself to using ONE color all the time). 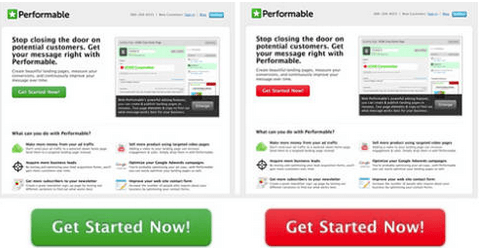 This research showed them that the red button outperformed the green button by 23%! You could be missing out on overall traffic simply by not tapping into the power of colors! It is a fascinating topic that marketers simply can’t get enough of! There should be reason behind every shape, every word, and especially every color included in your marketing. 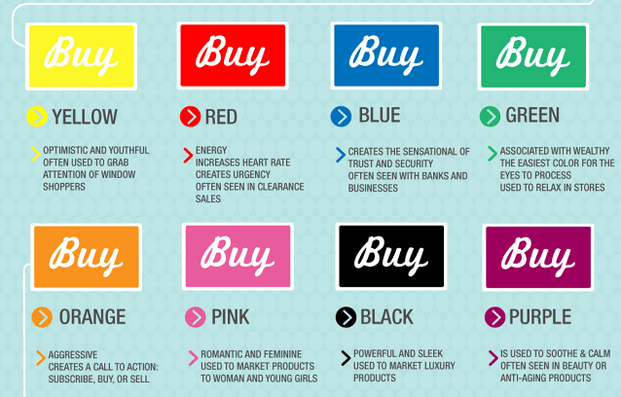 Here is a graphic created by Kissmetrics focusing on the Buy Now button and the use of various colors for different brands. Do YOU agree with the feelings and uses each color represents? Inspired to see what colors we suggest for YOUR brand? Give us a call and let’s start coloring!